Skincare Cosmetics® retinol night cream helps visibly improve resilience. Retinol face cream helps skin feel smooth and refreshed when you awaken. Fortified with 400,000 I.U.’s Vitamin A for a luminous, even-toned complexion. 1.7 oz. Night Cream: Water (Aqua), Petrolatum, Glycerin, Cetearyl Alcohol, Glyceryl Stearate, Silk Amino Acids, Retinyl Palmitate, PEG-8 Stearate, Stearic Acid, Diazolidinyl Urea, Carbomer, Methylparaben, BHT, Xanthan Gum, Propylparaben, PEG-40 Stearate, Triethanolamine, Tetrasodium EDTA, Ascorbyl Palmitate, Tocopheryl Acetate, Fragrance, Chitosan PCA. I use this each night after removing my make up and exfoliating and I love it!! Within two weeks, I have noticed that my skin appears healthier. It is nicely hydrated, fine lines have disappeared and my face is baby smooth! The cream itself smells great, it's not heavy and oily like some creams and a little goes a long way. Great retinol product. Goes on light; definitely improves skin tone. I used the product daily for several weeks with no changes in lines and wrinkles. Retinol is an ingredient suggested to reduce fine lines. I am 71 years old and decided to give it a try, even though I have very few fine lines and wrinkles and no gray hair! 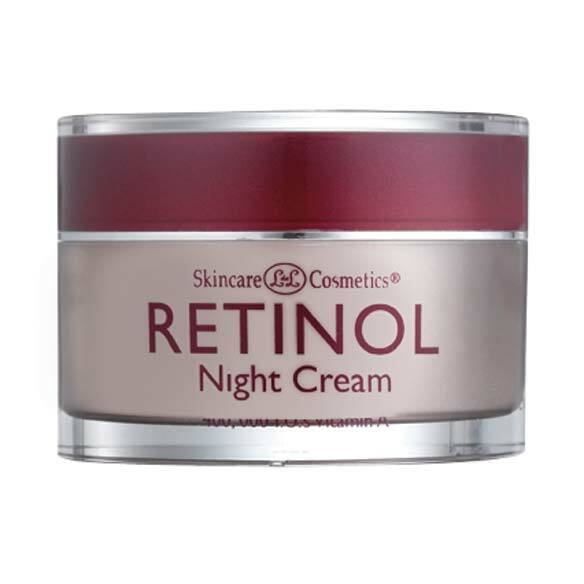 my wife likes this retinol night cream. she made me do it. I want my skin nourished while I am sleeping. This is the second jar that I will be using, and the first jar which I have just used up seemed to have helped the texture of my skin very well. I feel that it works and I like the scent. Looking to improve fine lines and wrinkles. retinol has a good reputation as an anti-aging cream. I love retinol, but the fragrance really done it for me. I use it all the time. It has made a difference. I chose this item because I've used it before and I like it very much. The texture is wonderful. Works well on my face! Great for smoothing out the fine lines on your face/neck. Helps to make you face/neck skin look younger. I recommend. I've been using this for several years and I'm pleased with the results.